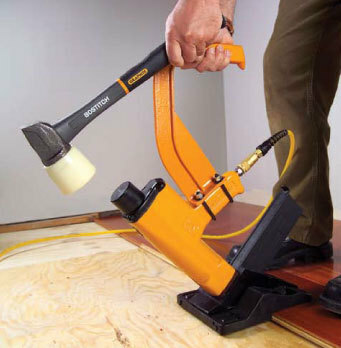 This pneumatic hardwood-floor stapler is a compact, mallet-actuated air stapler that automatically positions and drives staples for rapid installation of hardwood flooring. 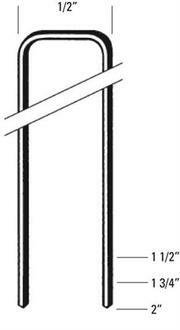 It secures the flooring at the proper angle and penetration without the danger of hammer marring. By simply resting the nose of the machine squarely against the work, the direction and angle of the staple is automatically aligned. This stapler is easily adjusted to handle different flooring thickness or tongue positions. This tool has an aluminum body for job site durability and low weight, and comes with an extra-wide composite base plate for added stability. It provides 420 in./lbs. of driving power, and has an operating pressure of 60 and 100 psi. It shoots fasteners between 1-1/2 to 2 inches, and the magazine has 92 fastener capacity.